A-HOTEL.com - Luxury and cheap accommodation in Berëzovskiy, Russia. Prices and hotel, apartment booking in Berëzovskiy and surrounding. This indicative offer was derived from the most recently booked accommodation in Berëzovskiy and sort by the price, from cheapest Berëzovskiy accommodation to the most expensive hotels. To select accommodation by your preferences we recommend to choose from 2 accommodation offers in Berëzovskiy in total. By entering the dates of your overnight stay in Berëzovskiy and using the filter tools you can sort the best possible accommodation for you. The entered dates of your stay are crucial for the most accurate offer as it derives all the online information on pricing and availability of Berëzovskiy accommodation. Then you can book the selected Berëzovskiy lodging (hotels, apartments etc.) immediately. Provintsiya Hotel is located in the centre of Beryozovsky. Free Wi-Fi and free private parking are provided. Set in Berëzovskiy, Гостиница Березка provides free WiFi. The property features a 24-hour front desk. Set in Yekaterinburg, 15 km from Dormitory of Sverdlovsk State Academic Philharmonic and 15 km from State Academic Opera and Ballet, ALLiS-HALL One-Bedroom Apartment at Lenina 48 offers free WiFi and air conditioning. This property offers access to a balcony. Солнечный is situated in Shartashkiy. Free WiFi is available. Adabi Hotel is located in Yekaterinburg, 8 km from Dormitory of Sverdlovsk State Academic Philharmonic. The property is around 9 km from State Academic Opera and Ballet, 9 km from Church of All Saints and 9 km from Sevastyanov's House. Located just a 15-minute drive from Ekaterinburg city centre, this hotel has an airport shuttle, a tour desk and an a la carte restaurant. Free Wi-Fi and free parking are available. Apartment NiceTravel is set in Yekaterinburg, 5 km from Dormitory of Sverdlovsk State Academic Philharmonic, 6 km from State Academic Opera and Ballet, as well as 6 km from Sevastyanov's House. Complimentary WiFi is available. Рассветная 6 корпус1 offers accommodation in Yekaterinburg, 5 km from Dormitory of Sverdlovsk State Academic Philharmonic and 6 km from State Academic Opera and Ballet. It is located 6 km from Sevastyanov's House and features free WiFi. Located 1.5 km from Mashinostroiteley Metro Station in Yekaterinburg, Bolshoy Ural na Stachek offers a 24-hour front desk and luggage storage. Located in Yekaterinburg, Abazhur Apart-Hotel Ekaterinburg Stachek features accommodation with free WiFi. Each of the units features a flat-screen TV, a fully equipped kitchen with a microwave, and a private bathroom with a bath or shower and a free toiletries. Featuring a bar and a restaurant, Tessa Hotel is located in Yekaterinburg. All rooms feature a flat-screen TV with satellite channels and a private bathroom. Offering free WiFi and city views, Marin Dom na Mendeleeva 31 is an accommodation located in Yekaterinburg. This apartment is 4. Set 2.7 km from Dormitory of Sverdlovsk State Academic Philharmonic, Hotel VERA offers rooms with air conditioning in Yekaterinburg. Oktyabrskaya Hotel enjoys a peaceful location beside a charming park, not far from Yekaterinburg city centre. It provides free WiFi and a pool, sauna and hammam. Offering free WiFi and city views, Apartment on Ulitsa Lodygina is an accommodation located in Yekaterinburg. Guests staying at this apartment have access to a balcony. Small Hotel Metro Uralmash is offering accommodation in Yekaterinburg. 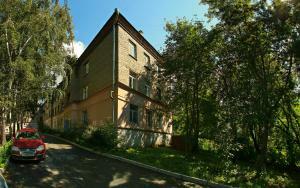 6 km from Church of All Saints, the property is also 6 km away from Uralochka Sports Centre. Set within 2.5 km of Dormitory of Sverdlovsk State Academic Philharmonic in Yekaterinburg, Апартаменты на Комсомольской features accommodation with free WiFi and flat-screen TV. Set 2.3 km from Dormitory of Sverdlovsk State Academic Philharmonic and 3. Located in Yekaterinburg, 3.9 km from Church of All Saints, Hostel Uspenskiy Dvor features a shared lounge and views of the city. Apartments Maryin Dom na Pionerskom offers self-catering accommodation located in Yekaterinburg. WiFi and parking are free.